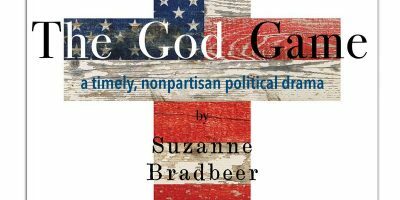 Front Porch Theatre at the Black Mountain Center for the Arts proudly presents The God Game by Suzanne Bradbeer, the first production of its sixth season. 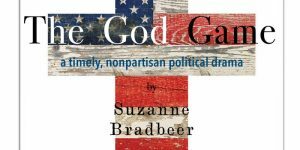 Described as a “timely, nonpartisan political drama,” The God Game is a play about faith and politics, marriage and friendship, choices and consequences. PLOT SUMMARY: Tom is a junior Republican Senator from Virginia, a rising star who is lately questioning his beliefs. His wife Lisa is committed to her husband, her family, and most importantly, her Christian faith and beliefs. When their long-time best friend, Matt, an openly gay conservative, approaches Tom with the opportunity of a lifetime, Tom faces a crisis of conviction while his marriage hangs precariously in the balance. The play runs on three weekends (Friday, Saturday and Sunday), from October 19 – November 4. Evening performances will take place on Fridays and Saturdays at 7:30 p.m., and matinees on Sundays at 2:00 p.m. All matinees will include a post-show talkback/Q&A with actors and/or the director. Tickets are $20. For more information and to purchase tickets, visit www.blackmountainarts.org/theatre. The Black Mountain Center for the Arts is located at 225 West State Street.